There are those who said even before the movie came out, speaking just on having seen the trailers that THE EXPENDABLES looked to be nothing more than Sylvester Stallone attempting to relive his glory days when he was one of the major action stars back in the 80’s. These good folks, having regaled me with their smug wisdom sit back and ask me what I thought of that. My response is that he does have glory days to remember and try to relive which is more than most of us will be able to say when we check out of this existence. And he’s blessed that he can relive those days in some excellent company indeed in this movie. THE EXPENDABLES will probably be most appreciated by those like me who remember the seemingly endless truckloads of action movies produced by Golan-Globus and Cannon Films back in the day. THE EXPENDABLES is a love letter to the testosterone fueled action genre of the 1980’s and testosterone is exactly what you’re going to get. Ladies who go see this movie should immediately check themselves in the rest room after viewing to be sure they aren’t growing hair on their chests or have a few more dangly bits they have no business having. 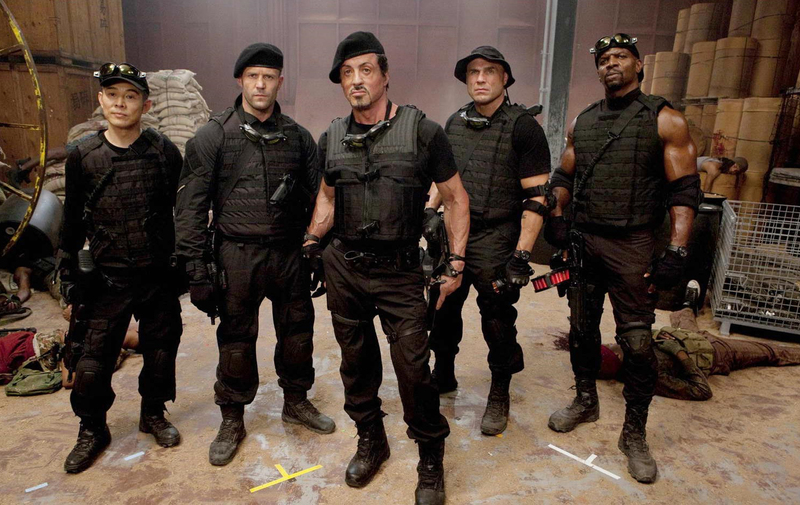 The Expendables (Sylvester Stallone, Jason Statham, Jet Li, Terry Crews, Dolph Lundgren and Randy Couture) are an elite team of mercenaries headquartered in a tattoo parlor owned by Tool (Mickey Rourke) who has retired from field duty but apparently handles the team’s accounts. He sets up a meeting with the mysterious Mr. Church (Bruce Willis) who wants to hire The Expendables to take down General Garza (David Zayas) the brutal dictator of Vilena, a South American country that would be a paradise if it weren’t for Garza’s death squads running around doing what death squads do best: cause death. Something about Sandra’s passion to deliver her country from the hell it’s becomes wakens something in Barney’s spirit and after a heart-to-heart with Tool, he’s determined to go back to Vilena and put things right. Not for the money but for his own redemption. Naturally his team can’t let him go it alone and that leads to The Expendables taking on an entire army in a massively apocalyptic battle that could easily qualify as Vietnam Part II. I had a lot of fun watching THE EXPENDABLES. Sometimes I’m awful easy to please and this movie had me right from the gunfight at the beginning. A gunfight that itself had more of a body count than entire movies. And who honestly can resist a movie that for the first time has the Holy Trinity of 80’s Action Heroes (Schwarzenegger, Stallone & Willis) on screen together? Oh, sure there are a lot of lines between the three that are nothing but nudge nudge wink wink to the audience but hey, it’s that kind of movie and I liked the whole “Hey! We’re puttin’ the band back together!’ feel of the movie even though this is the first time some of these guys have worked together. Stallone and Statham work together as smoothly as if they’ve been making movies together for the past ten years. Randy Couture was an unexpected source of humor as his character, demolitions expert Toll Road is the intellectual of the group. Dolph Lundgren gets to demonstrate his trademark scowl as the psychologically damaged sniper Gunnar. Jet Li also shows a surprising flair for comedy as he provides the movie’s running joke of him continually demanding a raise. His deadpan delivery is what sells the running joke and I cracked up every time he came up with a new reason why he needs more money. Everybody makes the most of their screen time and every one of the characters, good or bad gets a moment to show off which I really liked as both the good guys and bad guys are all accredited badasses and that makes the final showdown one between groups of equal skills and strength. That’s not to say that I don’t have my gripes with the movie. The Jet Li/Dolph Lundgren fight could have really been a David vs. Goliath type of match-up but the way it’s choreographed I really couldn’t appreciate Jet Li’s moves. 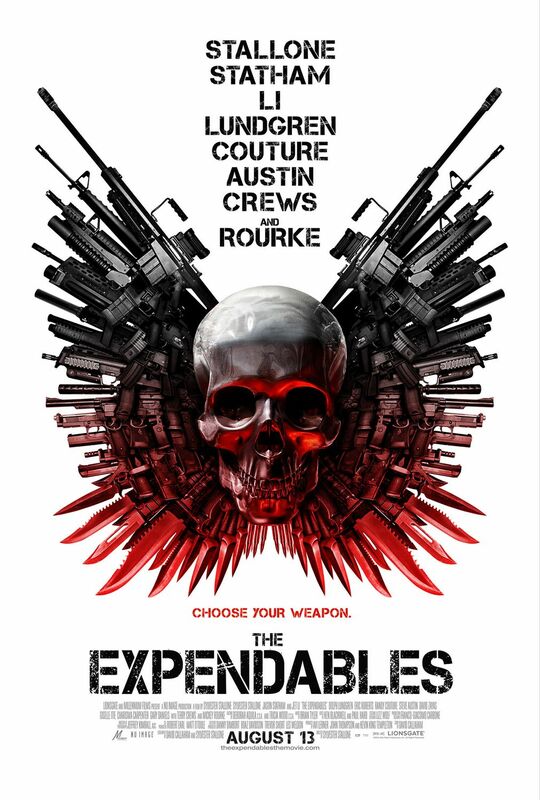 The Expendables all have colorful, wonderful names but I didn’t even know what the names of Randy Couture’s and Terry Crews’ characters were until I read them in the end credits. The editing during the hand-to-hand combats were too choppy for me at times and one thing I really hate in a fight scene is not being able to tell who’s beating the piss outta who. But that’s just me. The whole point of THE EXPENDABLES is as simple as a hammer to the back of an unprotected head: put a dozen tough guy actors together in one movie and give them 103 minutes to shoot, stab, blow stuff up, run over everything in sight, smash, slice and generally raise cinematic hell. And have a lot of fun doing it. I know I had a lot of fun watching them do it. Rated R: For the astounding level of violence in this movie. It’s not as jaw-droppingly brutal as say, the last 30 minutes of “Rambo” but its close. Great movie, but then again my tastes in movies run toward action, scifi, fantasy and horror. Not really interested in seeing a movie about people sitting around talking about the human condition. I’ve seen these guys star in movies I loved, and having them together was a real treat. As an old war movie buff I especially loved the scene where the old seaplane did the strafing run on the dock. If I had the cash I’d do a ego flareup like this too. One of the movies where I rooted for the fodder bad guys to shoot straighter and show some skills. Agreed all around, Derrick. A very fun movie with some surprising performances – who knew Couture could be so funny? I think what’s most impressive is that, for the most part, Stallone deftly blends all of these egos together, and gets such good performances from guys like Couture and Lundgren. Oh, I loved Couture and Terry Crews as well. How can you not love a character named Hale Caesar who takes out an attack helicopter by THROWING a missile at it?